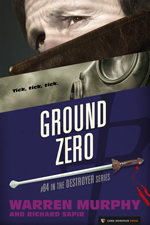 An entire town is wiped out by poison gas and Remo is sent to investigate. An environmental group, a real estate agent, a glory-seeking newsman, and a hippie chick are a few of the suspects. Even Sinanju skills cannot survive the blast of an armed neutron bomb. Chiun sees into the Void and this may really be the big finish.